Have you joined the Washi Tape craze? I first spotted this colorful tape on a wall at MyMaido, a Japanese stationery store at Santana Row. An artist used the strips to make a small mural. Though intrigued, I couldn’t see myself using it in that way. Over the next few years the colorful tape started popping up in crafting stores, the Scrapbook Island and on Pinterest. Washi is made of up the Japanese characters 和 (wa) which means harmony and is often used to symbolize Japan, and 紙 (shi) which means paper. So put them together, and it means Japanese paper. Unlike western paper which is made from tree pulp, washi is made from Japanese shrubs. Washi can be made of almost any plant, but is typically made from ganpi, kozo, mitsumata, or sometimes hemp. Washi is known in the west for the beautiful designs that are printed or painted on it, and its differences from other papers through its light weight and textured feel. I’ve always loved stationery, especially stickers and tape. It’s hard to describe the appeal, but it’s been there my whole life. I bought a couple of rolls of Washi tape at Scrapbook Island to use on a card, but then the rolls sat in my craft stash on standby, wondering what to do next. Now I can’t get enough of it. The prices have come down while the variety of colors and prints has multiplied exponentially. Some of the earlier tapes didn’t adhere as well, but that’s improved too. My friend Kelly uses colorful Washi tape to outline her gorgeous package labels. I capitalized on her idea and do the same. I also like using it to cover the ugly markings on a reused box before shipping. 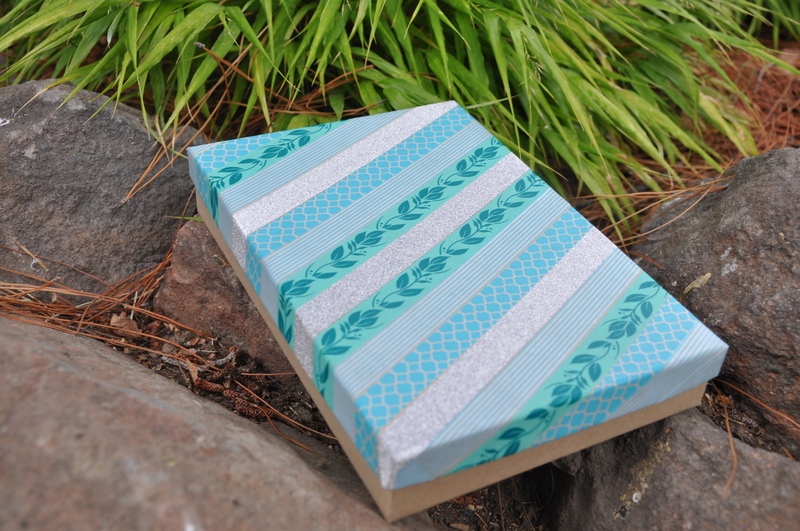 My friend Stephanie crafted a gorgeous card using the tape, and from there, inspiration struck: I used a similar pattern to cover a plain brown box with a friend’s favorite colors before sending it as a gift. No room is safe from this tape. 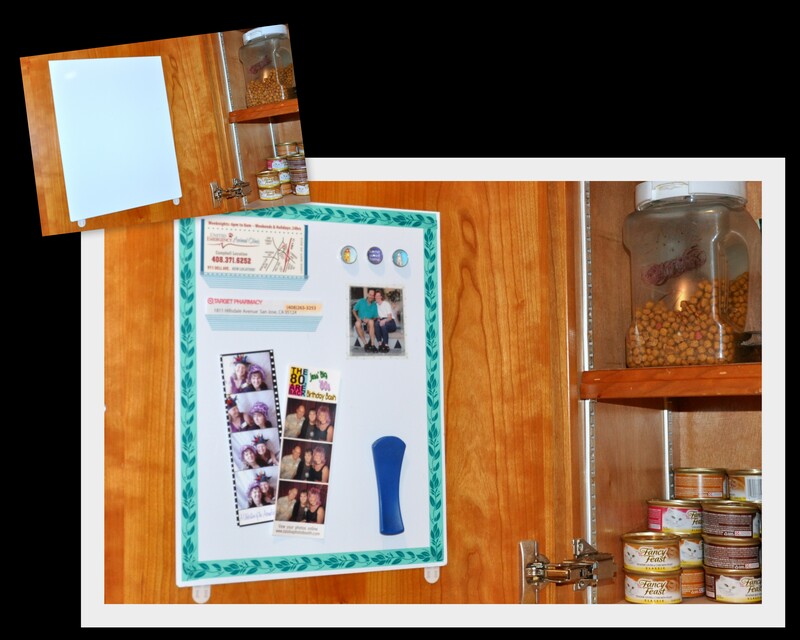 Several years ago I hung a framed magnetic board inside a kitchen cabinet to keep phone numbers and coupons at hand. Eventually the frame broke from constant use. I re-framed the board with Washi Tape, then added a few contrasting strips like a shelf under the cards. 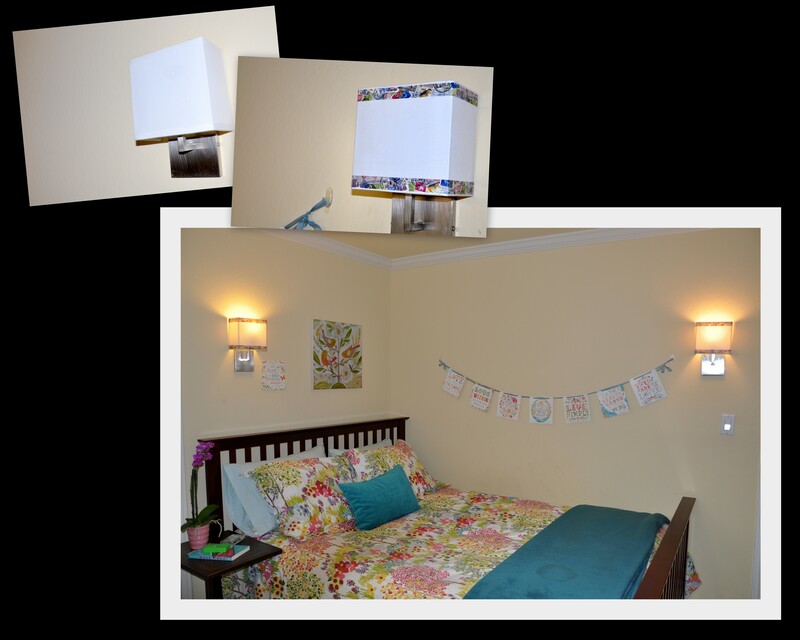 When I converted my son’s bedroom into a guest room this fall, I spruced up the wall lamp shades with postage-themed tape. It really added a nice finishing touch and was fun to do. It was nice receiving this free letter-opener in the mail but it’s not much to look at. I covered the advertising with Washi tape, beautifying an otherwise utilitarian object. Even the tiny house in my fairy garden got a new set of floral Washi tape drapes. Can you tell I’ve been having fun? How about you? Do you have a favorite something that you just can’t get enough of? This entry was posted in Arts and Crafts and tagged cardmaking, crafts, decorating with washi tape, DIY, uses for washi tape, washi tape. Bookmark the permalink. Like you, I adore stationery but have never got into using washi tape. Now I can see a whole world of possibilities opening up for me. Anne, it’s fun to play with this tape since it is so forgiving. You just lift it up and re-position it till you get your desired effect. I very much like how you are using washi tape Alys, You have inspired me to look at my pile with new eyes 🙂 I admit thought that when putting things in the post, the last thing I think about is washi tape – maybe I should keep them beside the packaging materials …………But I know I could use it as a decor adjunct! Such a good idea to use it to hide ugly advertising – I'm up for that immediately …… I see this evenings task already. I’m glad your box is keeping good company on your desk, Pauline! I definitely can tell you’ve been having fun! I have read about washi but haven’t used it–I’ll be on the lookout now! It’s quite addictive, Kerry. Happy Thanksgiving! Never heard of this stuff, but it looks fabulous. I will keep my eyes open for it. Could definitely use it to repurpose a box or make a mailing more fun. My package from Kelly was decorated so it was a gift before I opened it! Happy Thanksgiving, Alys. Lisa, yes! It’s great for packages. I have a pretty roll with festive bunting that I use on birthday cards. Grab a roll…I’m sure you’ll love it. Kelly’s packages are always a gift before opening. Isn’t she a talent? Oh Alys! I love washi tape too. Don’t tell, but I must have a dozen rolls and it makes me happy. 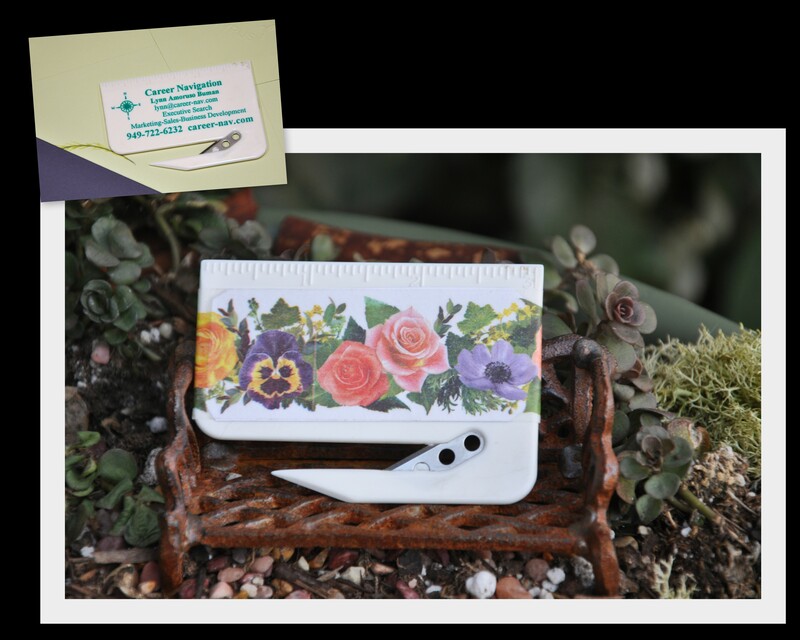 When I need a small treat, a roll of this wonderful tape fills the “want”…..I like to tear it off at an angle and place it on a boring envelope. Thank you for this safe place to confess my obsession. Mary Elizabeth, you are so cute! Your secret is safe with the internet. (wink-wink). I love that you are a fan of this tape, too. It is a fun little pick me up. I’m happy for you. I love washi tape. First heard about it about a year ago as a more environmental friendly alternative to sellotape. However, it is so much more than that. I mostly use it for decorating the brown paper I tend to wrap presents in these days. I was interested to find out that true washi tape is made from shrubs (Japanese) rather than wood pulp. That could account for why it’s ‘softer’ than paper. Anyway, good to see you having fun and being creative with your washi tape, Alys! Another Washi lover! Hurrah, hurrah! I hadn’t even thought of it from an environmental perspective. Good point! I love that you use it to wrap your packages. They sound pretty. Thank you so much for the information on the Washi tape. I’ve stopped by to look at it at the craft store but have not leaned into it yet. First I’m finishing up long standing projects before my creative juices can flow again. I so love seeing how you and Kelly use yours. It makes the packages a delight to receive, though I tend more in Pauline’s direction. Just glad to get it in the mail. My days are never long enough for all I want to do. 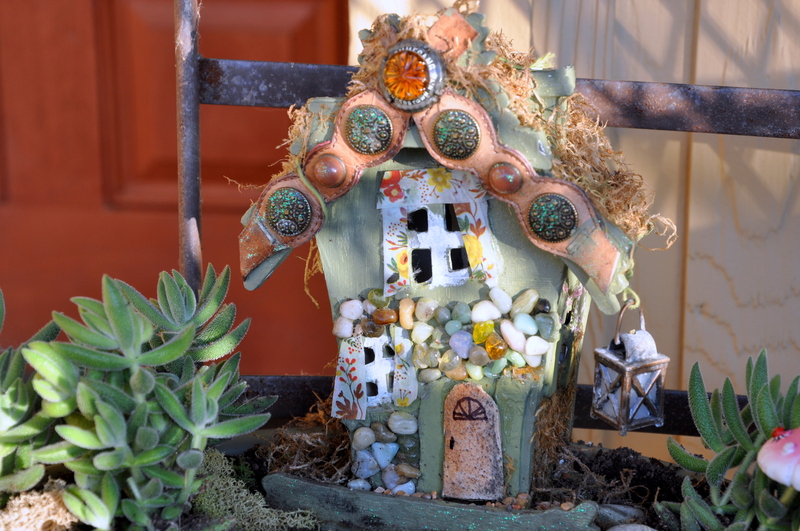 Love the fairy garden. Mines in the greenhouse right now hopefully not freezing. I would love to see your eyeglass case. It sounds adorable and no, I don’t remember seeing it. It sounds like a wonderfully finished piece, too, with Glaze and Stickles. You’re so creative. I love that you feel at home here. Your room is ready for many future visits. I’ll probably slip in a little more Washi tape too between now and then. I must agree that the duvet cover has held up well. It does have one small tear that I meant to repair and now can’t find it. Maybe those fairies took care of it for me in the wee hours of the night. I use the most neutral detergent I can find: unscented, clear and liquid. I have such sensitive skin that anything harsher does me in. It is sunny and bright but much colder. We’ve been hoovering around freezing at night with daytime temps five to ten degrees below norms (which is nothing for a hardy Canadian but a big deal for us thin-skinned Calis. Can’t wait to hear, read, see what you made in your card class. Hi Hon, sorry for the late reply. I’m up early drinking Jave in bed. Very decadent. I already gobbled up toast too. I’m glad to hear that your temps are warmer than normal. I’ve read the same about Bavaria. Meanwhile, New Zealand and Australia are having a wet spring, and are expected to have a drought by summer. I wonder if all of this relates to the current El Nino weather pattern? It’s amazing how a few degrees of warm water can alter the weather world wide. I’m glad you enjoyed a Java in bed. You need all the pampering you can get. Yah, maybe it El Nino. That ‘drought’ word is being used everywhere. I’m very worried. Hey? I came back to your post to reply but look, I took this screen shot of how your reply looks in my comment feed. Have you ever seen this before? 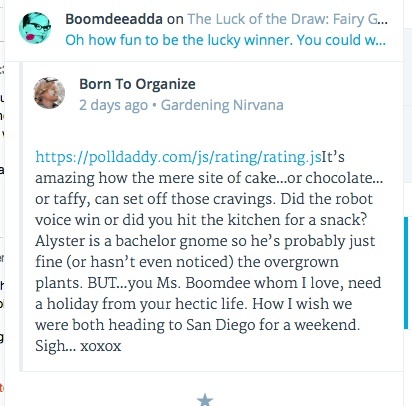 There’s a poll daddy url embedded in the front of the comment. I thought that was unusual and I haven’t seen it before. I just started seeing that polldaddy url myself and keep meaning to figure out what’s going on. 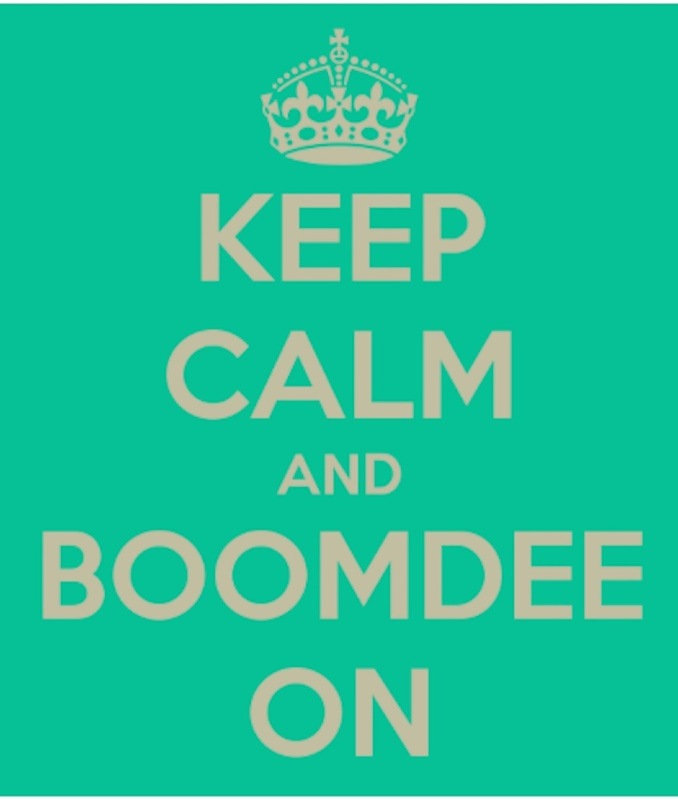 Are you only seeing it on my blog comments? Weird. Good suggestions. Let me give that a try and see if it goes away. I’ll also check my post to see if I inadvertently added something without meaning to. I keep buying washi tape and duck tape. I CANNOT STOP. i don’t even know what i plan to do with it all, your post gives me good ideas! Get better Soon ALYS> i know it is torture to be inside at the time of year…. My son went through a duct tape phase. He made wallets, coin purses and other creations before loosing interest. I’ve used zebra print duct tape on my sister’s walker, both the snazzy it up and to hold the break cable in place. As for Washi, the sky is the limit. I can’t wait to see what you come up with. Thanks for your support and understanding. So nice to see you here.